We have conducted our research and come up with what we consider to be the best handheld vacuums currently on the market for 2013/2014. These are based on user experiences, effectiveness for specific areas and if the product is actually worth its price. You may also find our updated Best Handheld Vacuum Cleaner Comparison Chart helpful. Here is our top 10 best handheld vacuum list. The ergonomically designed Hoover Platinum LINX Pet (read full review here) employs a comfortable grip and is easy to use. It’s designed for pet use but is also suitable for general use with its multiple attachments. It’s slightly on the large side but the removable 18 volt Li-Ion battery, wide attachments and adequately sized dirt container justifies the size. Fade-Free Power: Its suction power remains strong until the battery is dead. Includes 3 Effective Cleaning Tools: The Pet Upholstery Tool which features three rubber blades for easy pet hair removal, a Deluxe Dusting Brush with gentle bristles for delicate surfaces and lastly, a Power Head Brushroll that can be pivoted 25 degrees for more maneuverability. 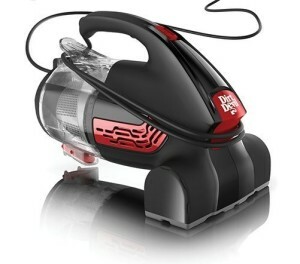 It Has A Battery Level Indicator: Not many cordless vacuums will tell you how much power the device has left. 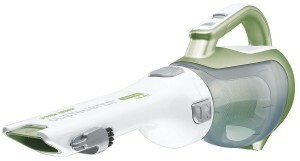 So we love the fact that this handheld vacuum instantly registers the remaining battery life through 3 LED lights. 2 Years Warranty: For a handheld vacuum at this price point, it’s only right and Hoover knows this. For many years, Dyson have wowed the world with their vacuum technology, and the DC44 (read full review here) is another one of their techy feature packed device. Its digital motor operates 3 times faster than conventional motors which makes it the most power efficient cordless vacuum. However, it can be a bit bulky and awkward to use because of the type of attachments it comes with. No Loss Of Suction: Dyson’s patented Root Cyclone Technology spins air at incredibly high speeds which results in dust, dirt, and pet hair flying out of the airflow and straight into the bin. No Need To Buy Extra Bags Or Filters: This device is bagless and doesn’t require a filter thanks to its Root Cyclone Technology. Gives The Option Of 2 Run Times: You can have 20 minutes of high suction power or 8 minutes even higher suction power in Boost Mode. Cleans Carpets, Upholstery & Pet Hair Effectively: It includes a main Motorized Floor tool which has two types of bristles engineered for cleaning different floor surfaces, and a Mini Motorized Floor tool that has increased power for tougher cleaning tasks. 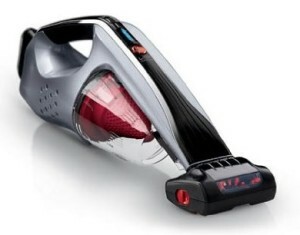 The BISSELL Cleanview Deluxe 47R51 appears to be basic, but it has a variety of features that will surely come in handy. It’s small but remains powerful due to it being powered by AC via an 18 foot cord, and it’s one of the more lightweight and compact handheld vacuums around. HEPA Media Filter: This type of filter targets and trap much smaller particles and pollutants, such as tobacco smoke, dust mite feces and pollen, so it’s very beneficial especially if you suffer from any breathing symptoms or allergies. Varied & Simple Attachments: Designed so simple yet effective, it includes a flexible rubber contour nozzle for getting rid of pet hair, a hose adapter nozzle for reaching tight spaces and a wide mouth tool. One of the most ingenious handheld vacuum designs we have seen is the Dirt Devil Scorpion (read full review here), which incorporates a Quick-Flip crevice tool at the top for easily reaching corners, edges and tight areas. With a 7 amp motor, it’s also pretty powerful. Ability To Quickly & Easily Clean Confined Areas: The Scorpion adopts a very convenient and clever Quick-Flip crevice tool which is simple yet so effective, as it flips down from the head and redirects the path of its suction power. Great For Cleaning Inside Vehicles: Due to its light weight and Quick-Flip crevice tool, it makes this handheld vacuum ideal for reaching any place inside your car. 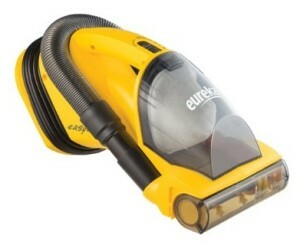 Easy To Clean: The vacuum is so easy to clean. Just twist and unlock it from the centre and the dirt container and filter completely separates from the base. 3 Year Warranty: This is positively surprising since this device is not an expensive product. One of Black & Decker’s most popular and bestselling DustBuster’s is the CHV1410L (read full review here) and for good reasons. It presents an effective cleaning device that has good charging and battery advantages, as well as a great price point. Long Run Time: Thanks to its Lithium Ion battery, users have been getting 15-30 minutes of constant power out of this. Uses Up To 50% Less Energy: This is due to its Smart Charge Technology which allows the device to only charge when necessary. Ability To Extend & Rotate Into Various Areas: The slim nozzle rotates and the built-in crevice tool at the tip extends allowing you to reach into confined and awkward areas. 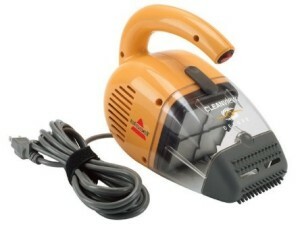 This Carrand 94005AS Auto-Vac is what we consider the best handheld vacuum for the purpose of cleaning a car interior. It’s no surprise because it’s exactly what it’s designed for and a lot of thought has been put into its functionality and attachments. It’s Powerful: It incorporates 550 watts of pure cleaning power, and remains consistently strong since it’s constantly powered by AC. Easily Clean Any Area In Your Vehicle: The 40 inch flexible hose (with 360 degree revolving elbow), squeegee, dash and console brush, carpet and upholstery tool ensures that no area of your vehicle remains dirty. It Can Blow: It has an incredibly useful blow feature to move debris or liquid out of hard-to-reach areas. Will Not Damage Any Surface: The squeegee and hose tip have rubber ends so you won’t accidently scratch any surface. On-Board Storage: All accessories can be neatly stored at the back of the base. It looks powerful and attractive in its red on black cylinder body and wide head. We know looks can be deceiving, but not in this case. The Dirt Devil The Hand Vac 2.0 (read full review here) is one of DD’s most recent models and they’ve designed this little beast with silent power in mind, and it surely delivers. Very Quiet: You can do your cleaning without constant ringing in your ears or disturbing others since it’s really quiet compared to other vacuums. 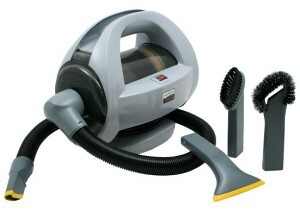 Effective Cleaning With Strong Suction: The motor driven high speed wide brushroll can roll through tough dirt and debris to ensure a good cleaning job on carpets, upholstery and getting rid of pet hair. Easy To Clean: Just one button to push, and dirt is emptied from the back. We’re impressed with Black & Decker’s Platinum range of handheld vacuums (read full review of the BDH2000L here), but it shouldn’t come as a surprise why they’re so effective. B&D have made sure that they’ve packed out their Platinum models with high performance features. 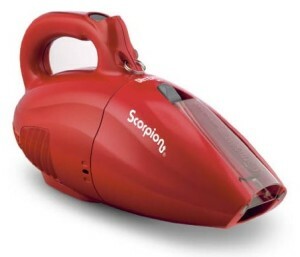 Strong & Long Lasting Suction: The high performance motor features Cyclonic Action Technology. Long-Life Battery: It uses a 20V Max Lithium Ion battery which can hold a charge for up to 18 months with no memory effect, as a result battery life is extended. Long Run Time: It has a very impressive run time with users seeing up to 60 minutes of power. Only Charges When Necessary: Incorporates Smart Charge Technology where it doesn’t charge when placed on the dock when it doesn’t need to, saving you energy. 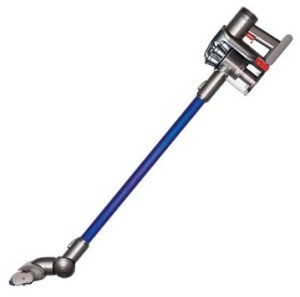 Easily Reach Tight Confined Areas: Features a slim rotating nozzle (just like the DustBuster series) with an extendable crevice tool at the tip allowing you to easily clean hard-to-reach areas. Easy To Clean: Twist open the head and empty the dirt container. It’s as simple as that. 3 Year Guarantee: With the price tag comes the guarantee for peace of mind. 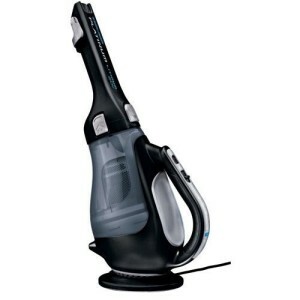 We find the Black & Decker BDH2000FL model (read full review here) more versatile than many other their other models in and out of the Platinum range, simply because it combines high performance with ease of use. This is made possible by its flexible hose and multiple attachments. 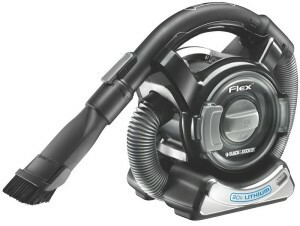 Strong & Long Lasting Suction: The Flex also has a high performance motor features Cyclonic Action Technology. Only Charges When Necessary: Also saves you energy by using Smart Charge Technology, which allows the device to charge only when it needs to when placed on its charging dock. Far Reach For Confined Areas: Provides a flexible stretch hose with a variety of attachments to reach into difficult areas. Filter Refresh Knob: When activated, it flicks debris off the filter to improve suction power, pretty neat feature! 3 Year Guarantee: Platinum model = platinum guarantee period. Our favorite handheld vacuums is the Eureka EasyClean 71B (read full review here), which also happens to be one of Amazon’s bestsellers. There are essentially two sections to this device, the front head which consists of the rolling brush and the center which is the stretch hose with crevice tool. Both work well together to give the user a thorough cleaning device. Effective Cleaning & Suction: There are two motors, one for running the revolving brush and the other for suction. Both combined gives an impressive cleaning performance. Ideal For Cleaning Stairs: The innovative Riser Visor is a clear plastic cover that stays down when cleaning horizontal surfaces but flips up to allow the revolving brush to clean vertical surfaces such as stairs and furniture backs. Able To Easily Clean Tight Areas: It has a stretch hose with an on-board crevice tool which both comes in handy a lot of times.